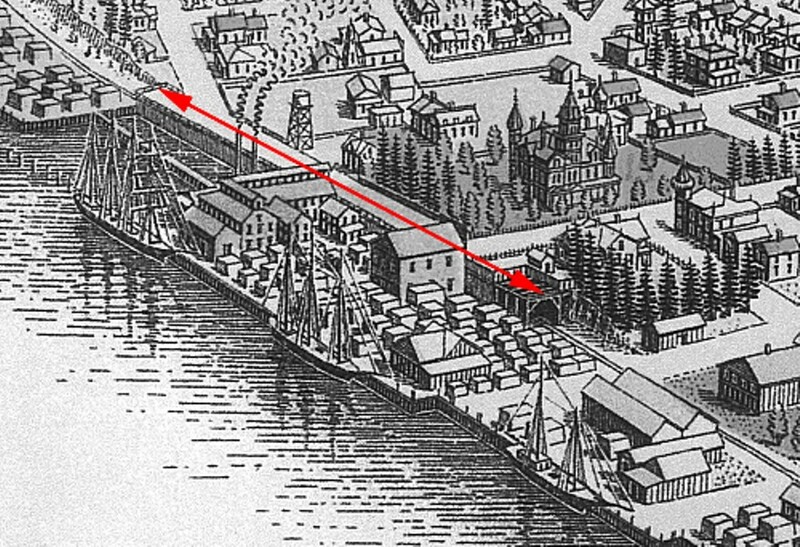 Part of the 1902 “Bird’s Eye” map of Eureka shows the tunnel (red arrows) which lay between the Carson mansion and the Dolbeer and Carson mill (present-day Halvorsen Park). (Humboldt County Historical Society/Timber Heritage Association). I was surprised to learn that Eureka was once home to a half-mile long railroad tunnel. OK, so "tunnel" is glamorizing what was basically a covered railroad, situated between what is now the County Library and Carson Mansion, and Halvorsen Park on Eureka's waterfront. Today, all that remains is the retaining wall on the south side of the tracks (photo). The tunnel was the result of a deal made between pioneer lumberman William Carson and the fledgling California & Northern Railway, formed in 1900. The C&N was one of two railways -- the other was John Vance's Eureka & Klamath River Railroad -- that vied to build a track directly from Arcata to Eureka. Prior to that time, you had to take a ferry across the bay to Samoa and then travel north to Arcata on the E&KRR. 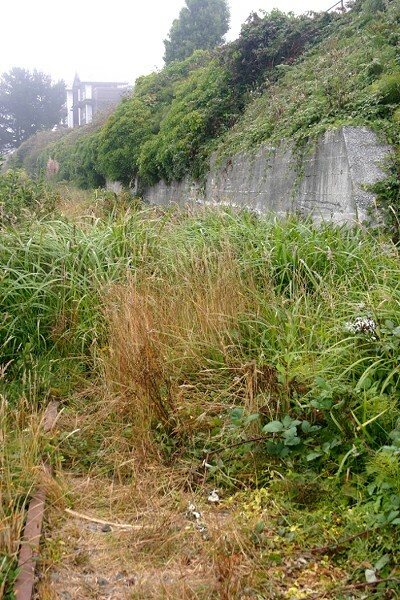 According to Mike Kellogg's recent article in the WhistlePunk, newsletter of the Timber Heritage Association, one barrier to building a track directly between Eureka and Arcata was William Carson's property: not just his mansion and the adjacent parcel now occupied by the County Library, but the whole swath of land north to the bay. At that time, Halvorsen Park was occupied by the Dolbeer and Carson lumber mill. Carson was willing to grant a 20-foot right-of-way to C&N with several provisos, one of which was that the rail line would be completely covered. In addition to providing access from M Street, this would also have protected drying lumber from sparks caused by locomotives. The roof of the tunnel consisted of four-inch thick redwood planks, some of which were still visible before the City replaced the roadway on the north side of Carson mansion with a concrete walkway. The tunnel was used by trains on their route between Eureka and Arcata from 1901 until its removal in 1920. Most of the track between O and L Streets was laid in just one weekend in April 1901, to avoid an injunction from the C&N's competitors. Later, an agreement for track-sharing was worked out between C&N and E&KRR, who had already laid the line down the center of First Street, where it can still be seen. Next time you're headed to Adorni on L Street, look right as you cross the tracks -- the retaining wall is still there, a memory of when we had a tunnel right here in li'l old Eureka. Barry Evans (barryevans9@yahoo.com) never saw a train he didn't like. He lives in Old Town Eureka. [Map] Part of the 1902 "Bird's Eye" map of Eureka shows the tunnel (red arrows) which lay between the Carson mansion and the Dolbeer and Carson mill (present-day Halvorsen Park). (Humboldt County Historical Society/Timber Heritage Association).